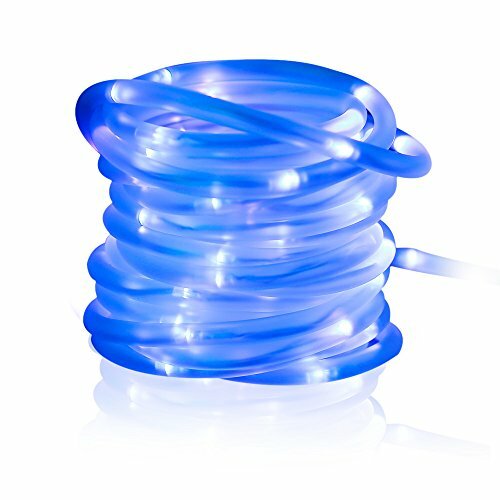 Total length: 33ft.including 32.5ft rope lights length and 6.5ft lead cable length. The solar lights should be fully charged by direct sunlight for 6-8 hours before initial use. [8 Lighting Modes]: Press the mode switch to adjust 8 lighting modes: combination, in weave, sequential, slo glo, chasing/flash, slow fade, twinkle/flash, steady on. [Solar Powered lights]: Solar powered 100 LED rope lights, solar panel(0.5W/150MA) with built-in 1.2V 1000mAH AA size Ni-Mh battery, 17h in steady on mode and 34h in flash mode long working time after charging under sun for 6-8 hours. [IP55 Waterproof]: Professional waterproof rope solar lights is perfect for outdoor decorations, such as garden, building, trees; also suitable for creating atmosphere for party, wedding, festival, etc. [Auto-induction]: The solar rope lights 39ft length(6ft lead cable included) with light sensor will turn on in darkness at night and turn off in bright area at day time automatically. [2 Year Warranty]: We will provide 7/24 online Customer Service, 24 Month Warranty and 90 days full refund guarantee for the purchase of the 33ft solar rope lights from MEIKEE. If you have any questions about this product by MEIKEE, contact us by completing and submitting the form below. If you are looking for a specif part number, please include it with your message.